Beelman Dental knows the true power of a genuine smile. Not only are smiles the easiest way to communicate feelings of goodwill, a smile is the automatic facial expression for joy. If you’re self-conscious about your smile, it’s hard to feel truly secure about your appearance. If you’re hiding your smile because you don’t like the way your teeth look, consider whitening or bonding for a little boost. You work hard to support yourself and your family, and you deserve to feel and look your best! Dr. Beelman will sit down with you to map out a treatment plan, working with your health history, dental situation and smile goals. Whether your individual smile design plan requires one type of dental procedure or incorporates several, looking better is just gravy. A sound, stable smile is always the goal— and we will work with you to make it as dazzling as it can possibly be. 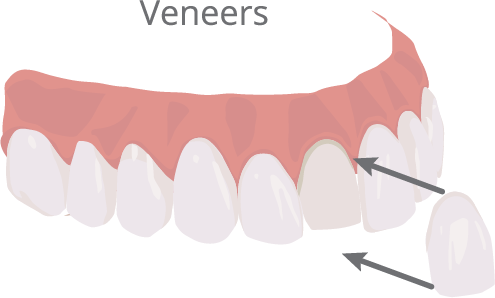 Veneers are stain-resistant, but since they are often used to correct damage from certain habits that are hard to break, Dr. Beelman may encourage cessation of tobacco, coffee, red wine, tea and soda use. Almost everybody wishes they had whiter teeth. The combination of some of our most beloved vices (coffee, smoking, wine, soda) and inevitable aging process dull our teeth, making them yellower and us appear older and more tired. Nobody has time for that! Dr. Beelman believes everyone deserves a smile they can be proud of – and we can help! Beelman Dental is happy to offer Zoom Whitening products as a building block in our teeth whitening services. While there are many over-the-counter solutions available for purchase at the local grocery or drugstore, the most value for your dollar comes from professional dental products. Zoom Whitening is effective, safe, and convenient – available from us not only as an in-office treatment, but take-home kits as well! Bonding is a no-fuss, non-invasive method for correction of many minor cosmetic issues. Tooth-colored resin is painted over the surface of the tooth or teeth to improve their overall appearance. Bonding also allows cracks to be covered and chips or gaps to be filled, improving the general shape and alignment of the teeth without taking drastic measures. You may be surprised what this simple fix can do for the look of your smile, not to mention appearance and self-esteem. Bonding is an affordable way to perk up your smile without the need for more major, cost-prohibitive treatments like orthodontics, restorative work, or even teeth whitening. Bonding can do it all! If you have any questions about cosmetic dentistry or would like to schedule an appointment with your Bedford cosmetic dentist, Dr. Beelman at Beelman Dental, give us a call today at (817) 409-3830 or request an appointment online below. We’ll take the time to make you smile!